Lembach is a small town about 12 kilometres south-west of Wissembourg in the Bas-Rhin department of the Alsace region, in the valley of the river Sauer. It falls within the dramatic steep-sided wooded scenery of the Vosges Regional Natural Park. 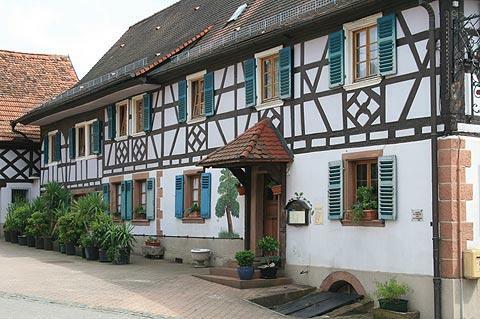 Although it is mostly visited for the surrounding countryside and castles, Lembach itself is also pleasant to explore. Start your visit at the 18th century protestant church in the centre of the village. This area around the church and Rue du Chateau and across the river to the mairie are the most interesting in Lembach. Note: the mairie is quite recent, having been built in 1957 to replace the 19th century mairie of Lembach that was destroyed during the Second World War. Other local monuments in the centre include the more imposing 19th century catholic church, a traditional lavoir, and a good number of traditional half-timbered Alsace houses including some along the banks of the river. Note: there are also quite a lot of houses in a more recent style so the village is not so charming as some of the more famous Alsace villages. Lembach offers all facilities including bakers, butchers and various options for accommodation. For leisure activities near Lembach there is a natural lake which is popular and has lifeguards during the summer (small charge payable). The area around Lembach reflects its history as a common point of conflict and as an invasion point from Germany, with castles and fortifications being the main architectural heritage. As a result Lembach makes a pleasant base for exploring the Alsace Route des Chateaux - there are lots of ruins of castles dotting the countryside on the border between Alsace and Germany, some within hiking distance of here and others a car drive. The Chateau de Fleckenstein is an important local castle particularly worth seeing and just a few kilometres north of Lembach. There are also the remains of various military sites related to the Maginot line in the vicinity - the most important at Lembach is the substantial concrete fortification at 'Ouvrage du Four à Chaux' (the Maginot Line was a line of defences constructed along much of eastern France before the second World War as protection against a possible German invasion). 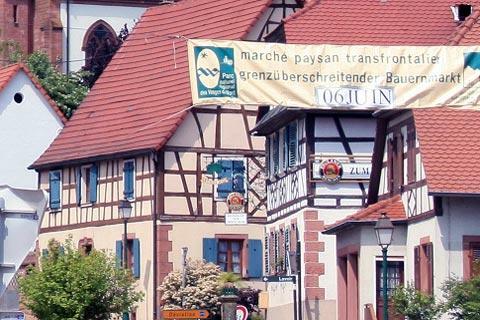 You can find more local travel ideas in the Bas-Rhin guide and the Alsace guide.